How Al-Qaida Returned To A Troubled Part Of Iraq : Parallels Western Iraq was one of the most chaotic parts of the country during the U.S. war there. Al-Qaida extremists were defeated once, but with U.S. forces gone, they've managed to return as Iraq continues to slide into chaos. 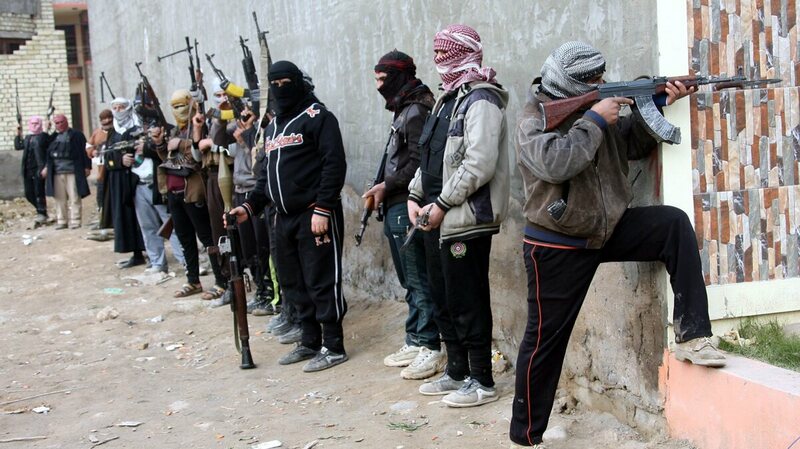 Sunni Muslim fighters in the western Iraqi city of Fallujah take up positions on Sunday. The insurgents have been fighting government troops in battles similar to those a decade ago in the area. Yet again, Iraqi civilians are fleeing violence in Iraq's sprawling western province of Anbar. Years of under-the-radar daily tension and bloodshed has erupted into another al-Qaida surge and retaliatory Iraqi government airstrikes. But the violence that brought Iraq back to the headlines, while tragic, was not surprising. For months, observers had been warning about the combustible combination of the Syrian civil war next door and the alienation of Iraq's Sunni Muslim minority. Back in July, the former U.S. ambassador to Iraq, Ryan Crocker, said that the U.S. needed to contain the Syrian civil war, which threatened to spread like a "forest fire" into Iraq. The Syrian uprising has been fueled by Sunni extremists from Iraq who joined the rebellion against Syria's President Bashar Assad and helped conquer towns and desert safe havens along the Iraq-Syria border. That gave operating space and motivation for the extremists to ratchet up the ongoing wave of terror attacks in Iraq. Those attacks, usually bombings, have mostly targeted the Shiite majority, killing at least 6,600 civilians in 2013. Now it has escalated into an full-on rebellion in Anbar, with al-Qaida-linked militias overrunning police stations and jails, and flying their flags. Iraqi Sunni men carry the coffin of a person killed by Iraqi army fire in Fallujah, in western Iraq, on Saturday. Sunni extremists have been battling Iraqi government forces in the region, in fighting reminiscent of violence a decade ago. At its core, the violence draws on the same problems that have plagued Iraq's Sunni population since the 2003 fall of their ally, Saddam Hussein. Remember that one of the primary goals of jihadists in Iraq - even more important for them than attacking Shiites or the Iraqi government - is winning over support of their own Sunni constituents. Part of their appeal to Iraqis is based on the vacuum in Sunni leadership since Saddam was toppled. While the majority Shiites were comparatively well organized around existing political parties and religious authorities, Sunni society atomized into local warlords and tribal chiefs after Saddam's fall. Once again, one of the most contested cities is Fallujah, long an emblem of Sunni unrest. Many pinpoint the start of the Sunni insurgency to an incident in the town in April 2003, shortly after the U.S. had toppled Saddam. I was among the throng of reporters who rushed to Fallujah from Baghdad after American troops opened fire on a crowd of Iraqis, killing several. The Iraqis were protesting over the decision by the U.S. Army's 82nd Airborne Division to set up a base in a school, preventing it from reopening for local kids. 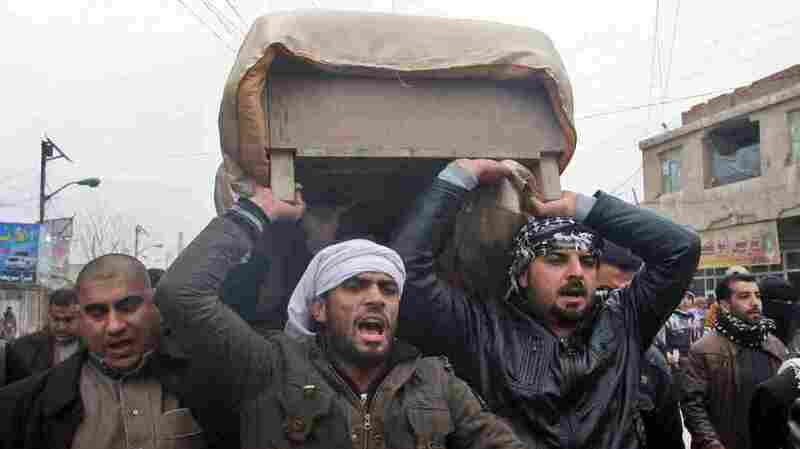 The troops said they had been fired on during the protest, but unarmed Iraqis were killed. Fallujah became a rallying cry for an Iraqi insurgency and the U.S. forces would twice besiege and evacuate the city in attempts to defeat the fighters there. The U.S. further alienated Sunnis by disbanding Iraq's Sunni-led army and barring many members of Saddam's Baath Party from government posts. Today, Prime Minister Maliki gets consistent backing from U.S. officials, but he is seen as dealing harshly with Sunnis and further limiting their access to power. Sunni political leaders and average citizens have been jailed, and torture in prisons has been documented. Meanwhile, Sunni areas throughout the country are in chaos. Some Sunnis are fighting back against the Sunni extremists in a backlash reminiscent of battles waged back in 2005, with key U.S. military support. Over time, the extremists were defeated back then. But even this latest round, which is also occurring in Syria and was outlined by NPR's Deborah Amos, is clouded by the past. Many Sunnis remember how they waged a tough fight against al-Qaida a few years ago, only to find themselves marginalized as Maliki's power increased. They're hesitant to stick their necks out again. U.S. Vice President Joe Biden called Maliki on Monday to offer American support and the White House announced it was stepping up shipments of missiles and drones to the Iraqi military. Biden made sure to include the Sunni parliamentary leader in the calls and urged him to continue opposing al-Qaida. But until political stability is brought to Iraq's Sunni areas, extremists are going to find fertile ground to capitalize on discontent and the war next door in Syria. NPR's Larry Kaplow reported from Iraq from 2003-9. You can follow him on Twitter @larrykaplow.